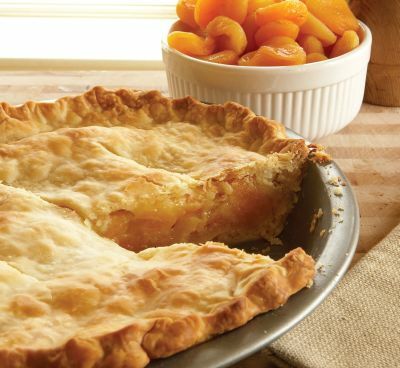 This lovely apricot pie recipe comes from a wonderful cookbook called The Amish Cook’s Baking Book . I think you will really enjoy this pie. Because it is made using dried apricots you can make it any time of the year. For the homemade pie dough crust: Roll both disks of pie dough out to a 1/8-inch thickness on a floured surface. Fit one of the dough disks into a 9-inch pie pan. Trim the overhang to be even with the top of the pie pan. Set the other rolled-out crust aside. In a small saucepan, bring the apricots and the water to a boil. Cook for 10 minutes over low heat. Add the sugar and cook for another 5 minutes, stirring occasionally. Using a colander, drain the contents of the saucepan, reserving 1 cup of the juice. Set the apricots aside. Pour the reserved apricot juice into a small saucepan and add the cornstarch. Add the salt and cook over medium heat until the mixture thickens, 2 to 3 minutes, stirring frequently until the consistency is like gravy. Arrange the drained apricots in the unbaked pie shell. Pour the thickened apricot juice over the apricots. Dot the top with the butter. Use some water to wet the rim of the bottom crust, which will help both crusts adhere together. Cover with the top crust and crimp the top and the bottom together all the way around. Slit the top 3 times and flute the edges. Bake for 30 minutes. Cover the edges only with foil, if needed, after 20 minutes, to prevent browning. Cool on a wire rack or windowsill until the pie is firm, about 45 minutes. Store any leftovers in a sealed cake safe. The pie will keep for about 5 days. Dried fruits and nuts are commonly sold in Amish-owned bulk-food stores. During tighter economic times, if fresh produce wasn’t available, Amish cooks would often rely on the dried fruits sold in the bulk stores. Today it is simply one of the nicest apricot recipes you will find. This recipe has you plump up the dried apricots, which results in a very fruity pie. Some say it resembles a homemade peach pie. It is homemade fruit pie at its finest. 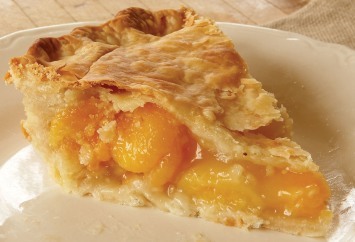 If you like this apricot pie, have a look at our apricot bar recipe too.